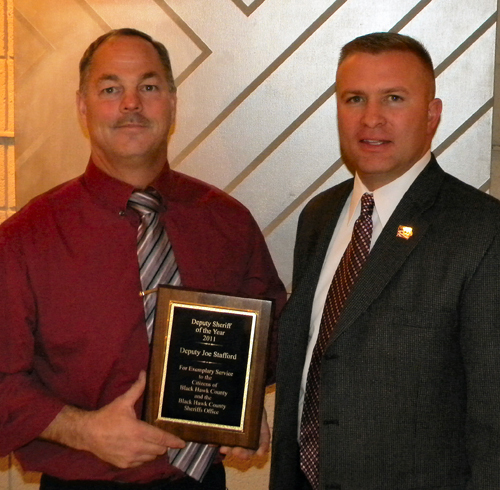 In a brief ceremony during the Black Hawk County Law Enforcement Association’s Christmas party, Sheriff Tony Thompson announced that Deputy Joe Stafford has been awarded the 2011 Deputy of the Year Award. Deputy Stafford was cited for his continuing work with our rural community school districts, his drug education efforts in those schools, his community outreach and his efforts on behalf of youth education, crime diversion and the Iowa Special Olympics. Deputy Stafford is the Community Services Coordinator, assigned to the Patrol Division of the Sheriff’s Office. He has been a deputy for 16 years, and has worked in the Jail Division, the Investigations Division with theTri-County Narcotics Task Force and the Patrol Division. “Deputy Joe Stafford has distinguished himself through his extra efforts on behalf of the Patrol Division, his partnerships with our rural schools, and his willingness to commit personal time and resources to further aid in the development of our range construction project. He has increased and improved efforts with Quakerdale to provide ‘Mobile Summer Camps’ for our metro area youth. He works with our youth diversion program ‘Shadow Boxers’, and is the local coordinator for the Iowa Special Olympics Law Enforcement Torch Run and Polar Plunges. I think it is easy to see why this recognition is so fitting for an officer such as Joe.” says Sheriff Tony Thompson.